For this month’s column, I wanted to take a look at a pair of debut fantasy novels that I’ve come across this spring. 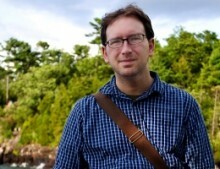 On the face of it, both are fairly different from one another, but they ultimately have quite a bit in common. Both are fantasies that share wonderful prose and plotting, and each are well worth your time to pick up and dig into. I had a chance to see Katherine Arden speak about her book when it was released. During her talk, she noted that the book came about because of her interest in Russian history. Prior to her time as a student at Middlebury College (where she earned a degree in Russian), she spent time abroad in the country, and noted that she had a particular interest in the folklore of the country. 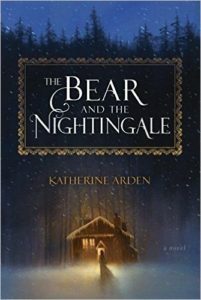 The Bear and the Nightingale is a novel that comes out of that folklore. It’s not so much a translation of the older tales, but a reinterpretation, much like Neil Gaiman has done with his recent novel Norse Mythology, or Mark Tompkins’ The Last Days of Magic, which imagine the supernatural world alongside the lives of realistic characters. This novel follows Vasilisa Petrova, the youngest daughter of a wealthy Russian. She has a particular gift: She can see the fantastic creatures that inhabit her home and the woods around her village. Vanya’s father eventually remarries, and her new stepmother shares her gift. Unlike Vanya, her stepmother, Anna, is terrified of what she sees, and tries to suppress what her stepdaughter sees. As this is happening, there’s a sort of power struggle taking place in the forests of Russia. A long-sleeping spirit is waking, and Vanya finds herself squarely in its attention. The central part of Arden’s book is concerned with the notion of competing mythologies: the ancient, pagan stories of medieval Russia, and the newer, modern faith of Christianity. Much like Tomkins’ novel, the book portrays Russia at a crossroads between the old and new worlds, with the heart and soul of the country at stake—in this case, literally. As an ancient creature awakes in the forest, a priest arrives at Vanya’s village, a man concerned with the salvation of the village, even as the local gods and paranormal creatures rustle just out of sight. At the heart of the novel is Vanya, a wonderfully fleshed out character in the midst of a vivid depiction of the Russian countryside. She’s a young woman caught in the midst of these changes in the world, from the spiritual to the practical, and steadfastly plots a course of her choosing, despite the wishes of her family and community. She’s a bright, interesting character that I can’t wait to see more of in the next installment from Arden. 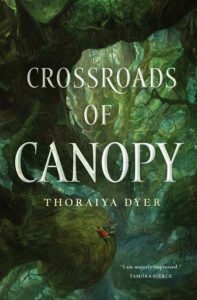 Another novel with a vivid central, powerful character is Thoraiya Dyer’s Crossroads of Canopy, the first installment of The Titan’s Forest trilogy. This is another impressive debut novel, one that goes all out in establishing an astonishing world that I can’t wait to see more of. In this book, a woman named Unar escapes her family to serve in a garden of a goddess named Audblayin. This world is a massive, multi-leveled rainforest, where thirteen gods rule the upper levels, which receive plenty of sunlight, tended to by a huge population of slaves and servants. Unar exists uneasily in these upper levels, troubled by what she sees as an unfair system. When she rescues a slave from death, Unar flees to the understory of the forest, where she’s forced to confront the nature of life in the upper stories of the forest, and where she witnesses the long-term consequences of the wealth and excesses of the society from which she came. Dyer takes a firm, hard look at a central theme in this novel: inequality. Her rainforest world is an ideal place in which to set this story—naturally stratified, the haves and have-nots are separated by the layers of the forest. When Unar visits the lower levels, there’s little surprise when we discover that a revolution is fomenting from the people in the Understory. They’ve been raided by their higher neighbors, their citizens taken for slaves. As is the case with The Bear and the Nightingale, Crossroads of Canopy is bolstered by the presence of a powerful lead character in the form of Unar. She’s a capable and ambitious character, one who steers her own course through this story, confronting the life that she once had as she learns the truth of her surroundings. Inequality and wealth are difficult things to write about without seeming preachy, and Dyer pulls it off nicely. While both of these novels draw from very different subject matter (Arden looks to real world mythology, while Dyer takes on second-world fantasy), they’re linked by a central premise: a strong female character who drives the narrative forward by her own choices and actions, rather than being pushed around by fate, society or anything else. As the first novel for each respective author, they’re debuts that are a strong first step in what’s hopefully a promising career for each.